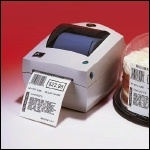 The direct thermal LP 2844-Z bar code label printer brings powerful performance to applications requiring a space-saving, desktop-size, 4.09" printer. Ease of use--including its OpenACCESS design and clear media window for simple media loading and monitoring--makes the LP 2844-Z a foolproof means to increase workplace efficiency. Model 284Z-20300-0001, 203 DPI, 4 IPS Print Speed, 8MB DRAM, 4MB Flash, Serial, Parallel, USB, US Plug, ZPL Language. Discontinued - Call for replacement. Model 284Z-20300-0041, 203 DPI, 4 IPS Print Speed, 8MB DRAM, 12MB Flash, Serial, Parallel, USB, Real Time Clock, US Plug, ZPL Language. Discontinued - Call for replacement. Model 284Z-20301-0001, 203 DPI, 4 IPS Print Speed, 8MB DRAM, 4MB Flash, Dispenser, Serial, Parallel, USB, US Plug, ZPL Language. Discontinued - Call for replacement. Model 284Z-20301-0041, 203 DPI, 4 IPS Print Speed, 8MB DRAM, 12MB Flash, Dispenser, Serial, Parallel, USB, Real Time Clock, US Plug, ZPL Language. Discontinued - Call for replacement. Model 284Z-20302-0001, 203 DPI, 4 IPS Print Speed, 8MB DRAM, 4MB Flash, Cutter, Serial, Parallel, USB, US Plug, ZPL Language. Discontinued - Call for replacement. Model 284Z-20400-0001, 203 DPI, 4 IPS Print Speed, 8MB DRAM, 4MB Flash, Serial, 10Base-T Prt Server, US Plug, ZPL Language. Discontinued - Call for replacement. Model 284Z-20400-0041, 203 DPI, 4 IPS Print Speed, 8MB DRAM, 12MB Flash, Serial, 10Base-T Prt Server, Real Time Clock, US Plug, ZPL Language. Discontinued - Call for replacement. Model 284Z-20401-0001, 203 DPI, 4 IPS Print Speed, 8MB DRAM, 4MB Flash, Dispenser, Serial, 10Base-T Prt Server, US Plug, ZPL Language. Discontinued - Call for replacement. Model 284Z-20402-0001, 203 DPI, 4 IPS Print Speed, 8MB DRAM, 4MB Flash, Cutter, Serial, 10Base-T Prt Server, US Plug, ZPL Language. Discontinued - Call for replacement. Barcode Warehouse manufactures quality products specifically for use in the worlds top thermal label printers such as TSC®, Zebra®, Eltron®, Datamax®, Sato® and more.